Having two major airports is both a blessing and a curse for the South Florida cruise market. On one hand having two options to fly into — Fort Lauderdale/Hollywood and Miami — means more competition, lower fares, and more options for your schedule. In that way, having two airports within about 30 miles of each other is great and a benefit to cruisers. On the other hand, it can mean that once you fly into the airport you still have a bit of a journey to get to your hotel or the cruise port. For us personally, we’ve found that Fort Lauderdale tends to have cheaper flights, but Miami offers cheaper cruises. So to save cash, that means taking a trip from the airport to Miami. As a general rule of thumb, we recommend using Lyft to make this trek. In our opinion, it’s among the cheapest and easiest ways to get from Fort Lauderdale to Miami. In fact, we recently took this trip ourselves to provide a first-hand experience on what it’s like. In total the one-way, trip cost us about $45 and took about about 40 minutes during a time with little traffic. Uber shows estimates in the same range. If you’ve never taken Lyft or Uber before, you first need to download it to your smartphone. This can be done through the Google Store for Android users or the App Store for those with iPhones. Once you download, you’ll need to setup your account, which only takes a few minutes. Still, we recommend you try installing the app before you leave on your trip instead of waiting until you get there. One you arrive at the Fort Lauderdale, you want to open the app and head to the designated ridesharing pickuptra location. This spot can be a little confusing to find if you aren’t familiar. You first head out to ground transportation and then follow signs to the area. There are pickup areas between the terminals so it can be a few minutes walk. In our case, we went to the pickup station between Terminals 3 and 4. Keep in mind that if you are unsure there are information booths near the luggage pickup area in the terminal that can help you find your way to the right spot. Look for the ridesharing signs between the terminals for the pickup area. Once at the rideshare pick-up location, you want to request your Lyft or Uber to pick you up. Your phone will detect your current location, so you won’t need to enter that information. You will need to enter your destination. Don’t worry if you don’t know the exact address. You can type in the name of a hotel, for instance, and the search feature will locate the address for you. Once you request the ride on Lyft you are given a cost for the ride, and you can see the details of the driver assigned to pick you up, including their name, photo, car, and license plate. In our experience, it takes about 10 minutes between the time you request a car until it arrives to pick you up. One important note is that you might see cars waiting in the rideshare area. You will need to wait for your specific car, not take one of these, which are waiting for other passengers. Keep an eye out for the car and driver and follow their location in the app. When they arrive, you’ll want to flag them down and hop in your ride. For our trip we were taking a cruise from Miami, but arrived a day early to enjoy the area. In our case we were headed to a South Beach hotel. One of the great things about using Lyft is that the service provides a cost before you ever get in the car. As long as you don’t change your destination or add a stop, you’ll pay the price you are quoted, even if traffic slows you down of the driver take a different route. In our case, the cost came out to about $45. Sure enough, at the end of our ride, this is the price we paid. We also included a $5 optional tip to the ride. So for about $50 for two people we were able to get from the airport to South Beach. 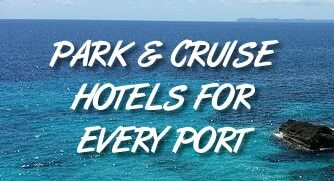 Given the proximity of our destination to the cruise port, you could expect pay about the same if you are headed directly to the ship. In addition to the price, the Lyft app also shows you an estimate of the time it will take to reach your destination. In our case, even with relatively little traffic the app estimated it would take an hour to go from the Fort Lauderdale airport to South Beach. In reality, it was faster than that. Our ride took only about 40 minutes, with about 5-10 minutes of that time going the relatively short distance from the mainland to our hotel in South Beach. Still, we highly recommend allowing yourself plenty of time. South Florida is notorious for traffic and just know that it can easily take more than an hour to make the trek in some cases. Just sit back, relax, and be thankful you don’t have to do the driving. Cars fit up to four people for the same price. However, if traveling with more than three adults, it could be a tight squeeze. We suggest requesting a larger car through the app (Lyft XL or UberXL offer seating for up to six). No need for cash when you ride with Lyft or Uber. All payment is taken care of through your credit card that’s entered into the app. There’s no exchange or credit card swiping done with your driver. At the end of your ride, the app will request a rating for your driver. Ratings are serious for your driver. Anything less than five stars is considered bad. Unless your driver did something wrong, try to rate them five stars. You’ll be emailed a receipt for your ride so you always have a record should you need it.